Location | Between New Cumberland and Dellroy in Tuscarawas and Carroll counties. From I-77 exit 93, take State Route 212, 11 miles to County Road 93. Boat Launch Ramp | The main public launch ramp is located off State Route 212 near the dam. A public ramp is also located at each marina. Atwood Lake Park | 4956 Shop Road NE, Mineral City, Ohio, 44656, phone (330) 343-6780. Park is open year-round, and is fully operational Memorial Day - Labor Day. Camping | More than 500 camp lots (class A with full hookups, class A and B with electric), are available on a first-come, first-served basis. Seasonal camping is available at a discounted rate. Group camping is offered in designated areas. 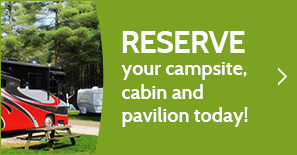 Park Amenities | Activity center, nature center, hiking trails, swimming beach, beach rentals (bumper boats, pedal boats, aquacycles) special events, daily acitivities, laundry, camp store, game courts, two-bedroom vacation cabins, concessions, playground, picnic shelters, camper cabins, hot showers, modern rest rooms. Atwood Marina West | 9298 Atwood Lake Road, Mineral City, Ohio, 44656, (330) 364-4703. Docking, boat sales and service, rental boats, fuel, accessories, restaurant and gift shop. Open year-round; seven days a week. Winter: Monday through Saturday 9:00am - 5:00pm, Sunday 12:00pm - 5:00pm. Sail & Power Marina | P.O. Box 57, Dellroy, Ohio, 44620, (330) 735-2323. Docking, boat sales and service, rental boats, fishing supplies, lunch counter. Open March 1 through November 1, seven days a week. Atwood Area Fall Festival | Held annually first weekend in October at Atwood Park. Features crafts, food, Civil War demonstrations, primitive weapons club, antique engine show, classic car show, haunted hayride. Hunting | Permitted in all nonrestricted areas, and regulated by the Ohio Division Department of Natural Resources, Division of Wildlife. Fishing | Fish are stocked by the Ohio Department of Natural Resources, Division of Wildlife, District 3. For current catch reports, contact the marinas. Hiking | In addition to the seven miles of trails located at the park, the Buckeye Trail, which links all four corners of Ohio, passes near Atwood Lake.